Are you curious about Medicaid waivers that may be available, as well as how they may assist your family? Our next Challenger Club Meeting is scheduled for Thursday, May 21st at 6:30 pm, where Becky Peters, the current Case Manager at Bright Start, will discuss how to apply for waivers within the DDSN system, as well as services provided by these waivers. Lorin Manos, DDSN, will also be in attendance to answer any questions regarding Medicaid waivers. 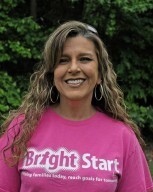 Becky, a native of Columbia, SC, has a strong history of working with special needs children. She is a graduate of USC with a degree in Exercise Science and a cognate in Motor Development. While completing her studies, she was offered a position at the Perceptual Motor Development Lab. Following this experience, she was given the opportunity to serve as an intern at Epworth Children’s Home, which later led to her position as an Assistant Preschool Teacher and finally, an Early Intervention Specialist. Becky was later hired by the Disabilities Board of Charleston County, where she served as the Early Intervention Specialist, and eventually the Program Supervisor for 4 years. After a move back to Columbia and taking some time at home with her children, she is now a part of the case management team at Bright Start. Her wide array of education and life-experiences are sure to provide an informative meeting. Be sure to join us Thursday, May 21st, at 6:30pm. Childcare is provided! Sprout Pediatrics is Now Hiring: Flexible Part to Full-Time Physical and Occupational Therapists!Child-Directed Play Therapy is the Fastest Way to True Mastery of Skills!